Welcome back to my page and I'm so excited for you to read this review! Today I shall be discussing about a London based brand which I am sure you've all heard of... RIMMEL LONDON! I have tested all these beauties out and I am keen to see whether you've all had experiences with this product too. So please be sure to email or comment below if you have any questions or feedback that you'd like to add. Helps to minimise the appearance of pores. Brightens the skin - with Vitamin C.
Gives a final radiant finish. First I'll start off with what I have noticed about using this BB Radiance cream. I've found that when applied onto my face, it made it look more radiant and matte. It gave a glowing and healthy look to my face and I'm glad that it's able to give me a natural look. I have tried the previous BB Rimmel cream and I have to say this would be a better BB cream for those wanting to get more benefits out it. The BB cream is formulated with nourishing shea butter which assists skin by really giving the much needed moisturisation that is needed to balance the skin from any dry flakes. There's Vitamin C present in the formula as well which makes this an ultimate benefit because it helps to brighten the skin by making it look even more glowing. In terms of it acting as a primer for my face, I felt that it was very illuminating and when I applied my blush, my skin felt as if it accentuated the colours I was using by making it look more vibrant. It also acted to soothe and conceal any of my imperfections such as freckles, sunspots and even minimised the appearance of my pores. Naturally, I have pores where it's obvious when I don't have any cream or concealer on, so by applying this BB cream onto the prone areas, I have observed that it covered really well and it just blended in perfectly. The consistency is not too runny and it provides a really nice looking and natural coverage to my finished look. I feel that I don't even need to over-use in applying the BB cream on. Overall, my skin with the BB cream on looks very nourishing and radiant. I don't have much acne to cover at the moment, so if you have a few blemishes on your face, you can easily conceal the prone area to a great degree. The formula is absolutely weight and I'm so loving how it does not feel heavy on skin. You can easily wear this without a powder finish but if you want, topping it off with powder will even give you more a matte look. I've also noticed the SPF 20 benefit which acts as the ideal sun protection in the BB cream. Having SPF is so essential for me as I don't want to get more freckles than I do now. So preventing or ensuring that my face is always protected is really essential when it comes to picking the right BB cream for me. This is really a super makeup product where it definitely gives you the 9 benefits! With regard to if there is any smell to this product...there's a pleasant and nice floral scent that comes from using the BB cream. I quite like this smell for some reason as it does not smell like zinc or metallic like other BB creams out there. The product felt like a smooth consistency and thick in a way where it can easily absorb into your skin and just cover up any of your blemishes that you may have. You don't need much for a full face coverage, all you need is a tiny dot to cover the prone areas such as the T-section of your face - and then just blend away with a concealer or blending brush. The product is presented in a unique orange tube with an orange cap. I think it's quite easy to use and squeeze out for product making very convenient for one to use. 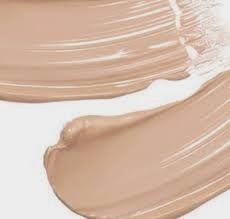 The BB cream is extremely easy to use. Once I fully cleanse my face with a good face wash, I would apply this first as the "base" because it already has primer + concealer + SPF protection + shea butter for extra added moisturising effect! So I would use a blending or concealer brush and blend the product on my face like so and then if you prefer to finish off with a powder, then you may do so. Overall, I think I'll stick to this BB cream for now because it's like MAGIC. To find a BB cream that gives you 9 benefits - I think this truly worth a buy! I feel that it made my makeup look really natural and glowing. My face stayed super moisturised all day long, plus it had added SPF protection to protect my face against the hot sun! I definitely will rate this BB Cream Radiance a 5/5 stars! Good work Rimmel London as I am really impressed! Makes your face look very radiant, natural and with a healthy glow. Formulated with Vitamin C + with nourishing sheet butter for a brighter and moisturised glow. Lasts all day long, no smudges. Primes. Perfects + smooths out your skin. Available in THREE shades: Very light, Light and Medium. Can make tired skin feel AWAKEN! Use a blending brush to blend thoroughly and throughout your face. Available at Priceline, Priceline Pharmacy stores, Target, Kmart, BIG W, Chemist Warehouse, selected pharmacies and selected Woolworths. *Image from the official Rimmel website - Light Rimmel BB Radiance swatch. 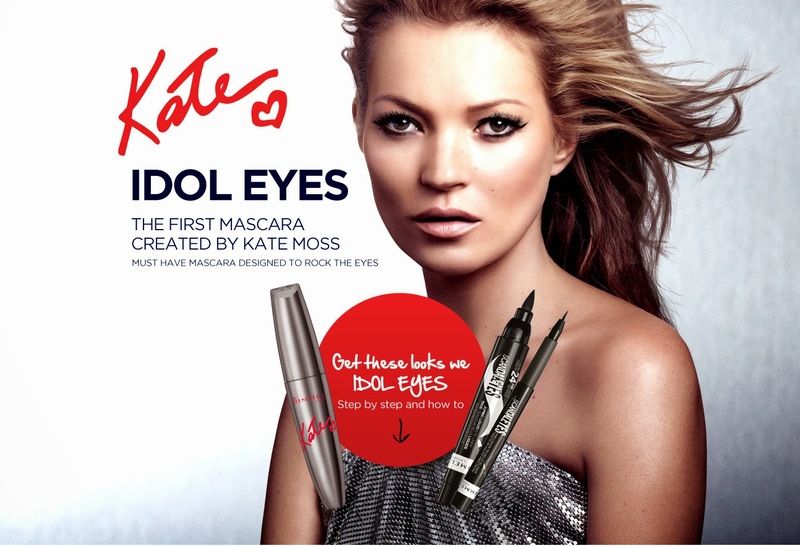 It was pretty interesting to see Kate Moss represent the First Mascara by Kate Moss range for Rimmel London. She's collaborated with the brand to really show off her trend setting mascara. I have to admit when I first saw the mascara's product packaging for a mascara, it's super sleek, shiny and reminds be of a fierce woman in charge of her life! The colour in mascara as pictured in the image above is 004 - Eye Rock Jet Black. The black is an intense black pigment which comes with a broken heart shaped style as the applicator brush. I feel that this brush creates more of a dramatic look and it grabs onto your eyelashes to give it a defined voluminous and stylish look to it. From using the product, I found my lashes to be more voluminous and more longer. My lashes looked pumped and by using the brush - it lifted my lashes in just one stroke. I eventually went over the lashes again to create more of a bold look to my lashes. I also felt that the brush grabbed the hard to reach lashes and this was good because it's usually tricky for me to not reach them lashes without smudging my eyes or so. I found no clump to using this mascara which is good because we all don't want clumpy looking lashes at the end of the day. As previously mentioned about the packaging of the mascara, it is a beautiful sleek, metallic shiny cover to it. And with the brush being a broken heart shaped style, it gave me more chances on reaching the hard to get lashes - the easier way. This is ideal as I always look to curl my lashes without any hassles. This will definitely cut my make-up time by a few minutes, but at least this gives me more time to focus on preparing to get ready. There's no particular harsh smell to the mascara and it comes with no strong smell. The product is super easy to use, once you curl your lashes with an eyelash curler - I would then curl them with the Scandal'eyes mascara. I am super satisfied with the mascara - and the only thing that it would be great to see is if it came in waterproof. Furthermore, I am giving this mascara a 4/5 stars! The blackest mascara I've come across so far. Broken heart shaped brush is designed to reach hard to get lashes + hugs the lash line. Lashes are plumped, lifted and looks voluminous. Comes in a sleek, metallic designed bottle. Not waterproof although it's a great voluminous mascara. Avoid rain to prevent smudging or water contact near the eyes. I have on Rimmel London - The First Mascara by Kate Moss. The two liners are completely different from each other, one being thicker and the other thin. I would like to share with you what I thought about these liners. They are all great products because what makes them all so great is that you can create different looks with both liners. Whether you want minimal eyeliner look, then go for the micro liner. Otherwise, the jumbo comes with an easier application of lining my eyes. I'll start off the with the SCANDALEYES JUMBO liquid liner which is the thickest of Rimmel's range. It's in a form of a felt tip pen and kind of reminds me of one. You can draw with ease and without any hassles. When it comes to precision, it certainly lines very well and accurately. I usually like drawing wings for an eyeliner look and with using this JUMBO liner, I've found that it's so much easier creating the cat-eye-flick. I have more control using the liner because the pen is thick and you can easily release more product out of the liner. From using the liner, I've found that it stays on ALL DAY for me and the colour is really impacting from the first application. It's so much easier to use and this is my first time trying out a JUMBO style liner. I am in love with the easy application of the liner. I've also noticed that I don't even need to re-touch on the eyeliner as it stays on for the whole day. It's waterproof, smudge proof, tear proof --- so good that this is the ultimate liner for all unpredictable weather conditions. On the other side of micro things, the SCANDALEYES PRECISION Micro liner gives me more of a youthful and playful look. It's subtle in a way and not too dramatic compared to the jumbo liner. I found that the Micro liner is super easy to use and hold -- especially when it comes to lining my eyes because I have hands that always shake. Having this pen to hold and with its micro liner tip makes it even easier for me to apply on my lash line. If you're wanting maybe a super fine line look, this is ideal as it's easy to draw onto your eye lids. It's very gentle and does not hurt me when I apply the liner onto my eyes. The liner does not drag your eyelids and the colour goes on smooth. Both liners are soooo pigmented in colour making the look more intense. This is my ideal black liner colour and I am impressed by how well it shows up on my eyes. It dries really quick for an eyeliner so I don't have to wait several minutes before I can start heading out with my intense look. The fact that it's smudge proof makes it a decent liner to purchase because it can resist about anything from water. Both liners look like a pen and the tips have a super defined shape which is ideal for creating a defined lined look on your eyes. I am happy to use these as my regular eyeliners and definitely will give these a rating of 5/5 stars. Creates a bold & intense black eyeliner look. The JUMBO liner is good for an accurate application. The MICRO liner is good for more of a feminine look. Formula of the eyeliner dries really quick. Long lasting and lasts so long up to 24 hours. Before applying eyeliner, best to use an eye primer to accentuate the intense eyeliner look. I hope you all enjoyed reading about the NEW RIMMEL LONDON make up products. Should you have any questions regarding them, please feel free to let me know in the comment below or you can email me. *Thank you RIMMEL LONDON for supporting me for this review. My reviews are based on my personal and true experiences. I only recommend products that I truly support. Labels: BB, beauty, BLOGGERS, cream, CREATE, DRAW, EYELINER, KATEMOSS, LIFE, LINER, LONDON, love, makeup, MASCARA, PASSION, rimmel, SHOP.